UPDATE: Gadzooks! These are now full, I'm told. There has been such a robust demand that I may try to organise some more blogging workshops after the festival. If you want a heads up about those, leave a comment with your email, or send me a message at themanchizzle at gmail. Sorry to those who missed out this time around. Just wanted to say that there are still a couple of spaces left in the two blogging workshops we're running Saturday, Sept. 29. Blogging for Writers will go over the basics of blogging as a tool to market your work, experiment with different styles and get projects off the ground. And have fun writing! It'll be led by myself and the amazing Elizabeth Baines (Tart of Fiction/Fictionbitch), an author who has made excellent use of blogging both professionally and creatively. 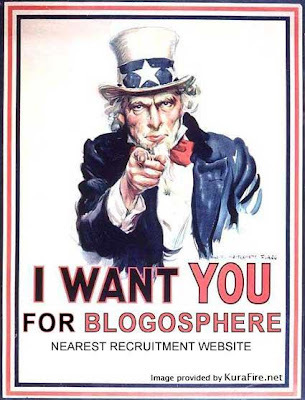 So You Wanna Be a Blogstar? is a general blogging workshop ideal for anyone setting up a blog, or anyone who has been blogging for a while but needs a little inspiration. It'll be from 2-4pm, and will be led by myself and the awesome Chris from Mancubist, which is shortlisted in the arts and culture category at this year's MBAs. Both are just £2, and take place at MDDA headquarters on Portland Street. We will have computers available for those who need them, but the place has wireless so you can bring laptops if you like. Book here at the MLF site.